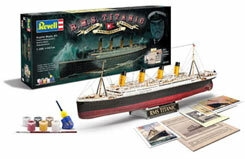 All Products > "05715 Revell 1/400 100 Yrs Titanic Set"
This gift set comes in an informative special pack for the "Titanic Centenary". In addition to the plastic model kit to scale 1:400, this exclusive set includes 6 basic colours, a brush and adhesive. Special inserts are enclosed showing original reproductions of historical documents. These are: 3 post cards, a firstclass menu, a 28-page publicity brochure for the White Star Line.